The trial and the riots are one of limitless examples of racism in America. This instance highlights the racial tensions in Los Angeles, a city with a large Chicano/Mexicano population. The men who were tried were done so in an effort to indict the Chicano community as murderous and violent. This further escalated the racially tense Los Angeles area. The most vehement of America’s racists, the armed services, took advantage of this heightened tension and sought out and beat men and boys, Chicano and black. 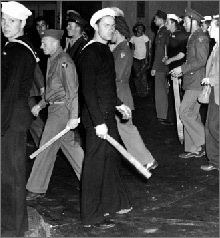 The riots were largely aimed at the Chicano community, but other oppressed communities felt the fists of the sailors and soldiers. The zoot suit riots are a famous example of American racism, but there are many others. Incidents like this have happened all over America, including California, the Southwest, and the South. Racism and brutality is a part of American history, from lynching to residential schools. There have been other racially motivated public showings since the time of the zoot suit riots. The riots that followed the beating of Rodney King by LAPD were in protest of police violence against the black community. One, of many, contemporary examples of racism against Chicanos/Mexicanos is the actions of the Minutemen, particularly in Arizona. Shawna Forde, a leader of the Minutemen Civil Defense Corps and the Minuteman American Defense, was recently convicted of the murder of Raul Flores and his daughter Brisenia Flores. This was one of a series of crimes planned or perpetrated by the minutemen in Arizona against Chicanos/Mexicanos. The settler population of the US is vehemently racist against those from whom the land was stolen. There are numerous examples of settler brutality against oppressed communities throughout the history of the United Snakes. The zoot suit riots were perpetrated by the armed wing of settlerism, but the settlers themselves, such as Shawna Forde, are intimately involved in violence perpetrated against the Chicano/Mexicano communities across the Southwest and West.